Or we could call this post A Boy and His Dog because Stink Monster is the nickname we have for our dog Winston. We brought Winston home when he was just a puppy. This was the first time I’ve had a dog where I knew who his dog parents were AND we picked him out of the litter. We visited Winston for weeks at my friend Dana’s house before he was old enough for us to take him home. At almost two years old, Winston has pretty much established himself as a member of our household. Being a part of our house means you get your own nickname and Winston has about 5 of them. Jake’s nickname is Peanut. He was so small as a baby and a toddler that there was nothing else to call him but Peanut. I have a feeling Jake has a nickname for me but he hasn’t shared it with me yet – probably worried what I’ll do if I find out what he really calls me behind my back. When Winston was about a year old, he was officially knighted by Jake and myself so his full name became Sir WinStinkerton. We made it up one day when Winston was far deep into the stinky side of being a dog and in desperate need of a bath. Then it just turned into one of those words that’s funny to say out loud, which then led to the shorter version of just Stink. The addition of the term monster was added a few months later when a neighbor commented to me about how fast he was growing. She would say that he wasn’t a dog, he was a monster. So he officially became The Stink Monster. One of the best things I’ve watched developed is the relationship between Jake and Stink. As Jake started to get old enough to play with our other dog Woodrow, it was pretty obvious that Woodrow was too old to do anything but lay on the floor and look at Jake like he was crazy. But along came Stink and the perfect solution to keep Jake occupied when I was too busy with work or just needed a break. Last month we took a drive out to the dog-friendly beach for the day. It was the first time I actually got to read a book and relax. Jake and Stink played together the entire day. 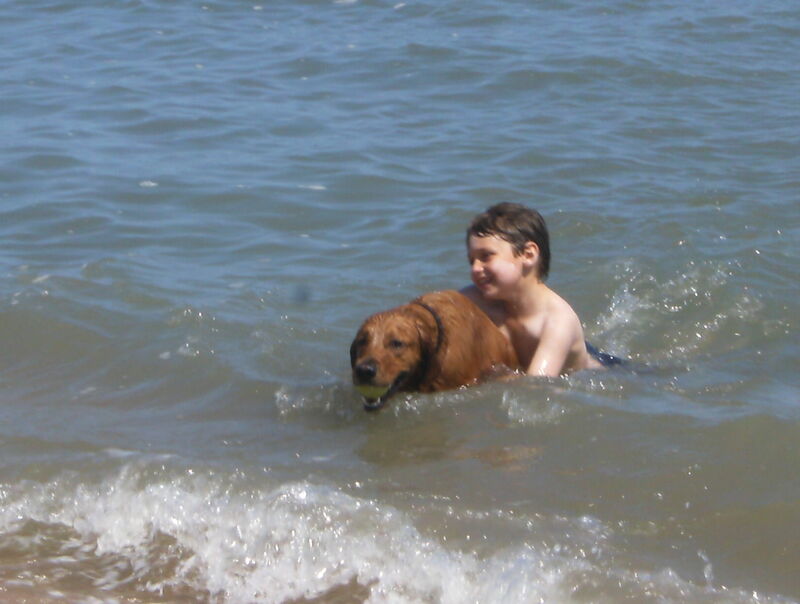 When Jake went into the ocean to play in the waves, Stink ran in water to be with him. 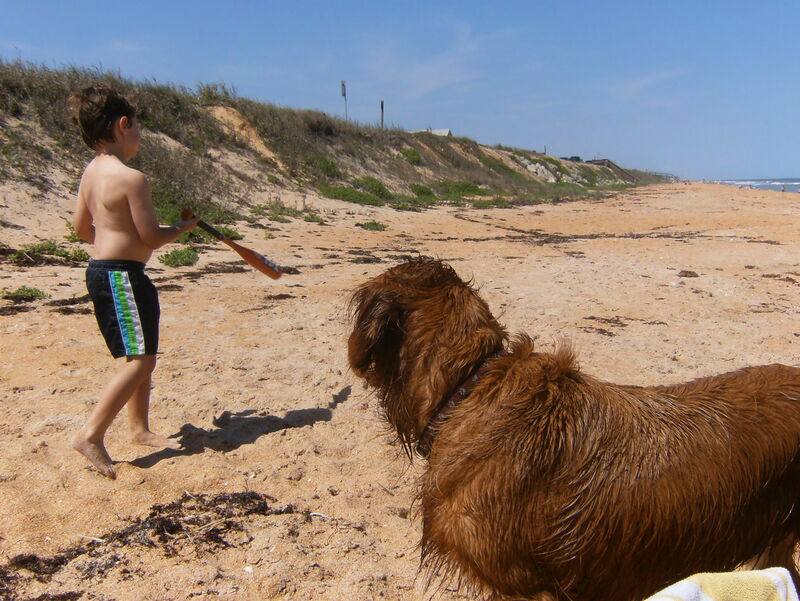 When Jake got his bat out and started hitting tennis balls into the sand, Stink Monster was right there with him. Stink chased tennis balls as long as Jake would keep hitting them. 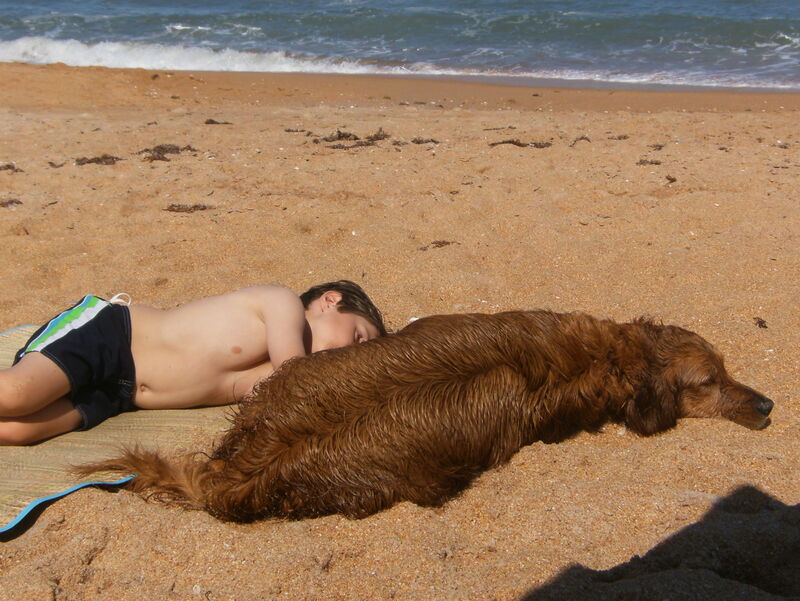 And when Jake was worn out and done for the day, Stink laid down right next to him. As Jake has gotten older, he’s been less demanding on my time and attention as he’s learned to entertain himself. 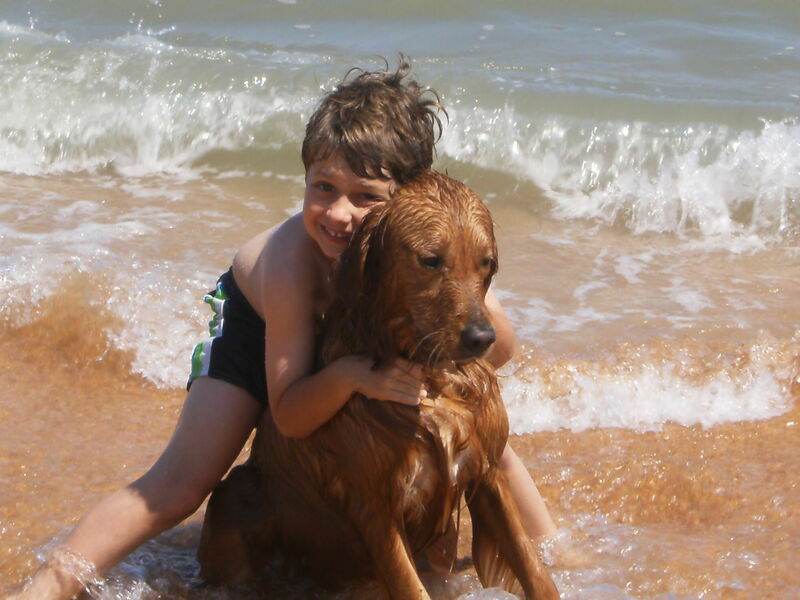 There were days when I would feel bad because Jake was an only child and I was the only one around to be his playmate. He would want to play a game and I would be tired. He would want to watch a movie and I had to finish a project for work. After our day at the beach I realized something. Jake didn’t need a sibling for a playmate. He just needed a Stink Monster. And this is why I love dogs, there are no better friends. Those pictures are great, looks like everyone had all sorts of fun. This is our second golden and they’re really the greatest dogs, at least in my opinion. Probably best thing I ever did was to get the second dog when Jake is young to play with him.